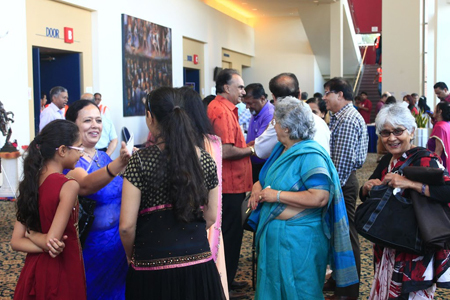 Manick Sorcar, his wife Shikha and the performing group received a standing ovation when they came on the stage after the show to take a bow, generating a thrilling end to the long awaited laser extravaganza on Swami Vivekananda in Houston, Texas. It was held at the prestigious Stafford Centre, a posh theater in Stafford, a suburb of Houston, which has hosted artists such as Willie Nelson, Charlie Daniels, and symphony concerts. 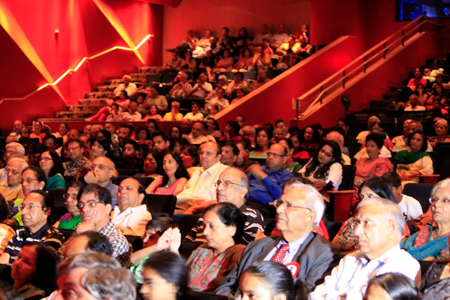 The event started at 4pm with a slide/video show and speeches by SEWA International Houston Branch that lasted for approximately 30 minutes. 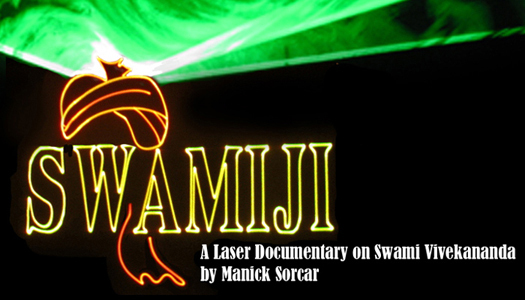 "Swamiji" program consisting of a laser-live "Prayer" and "Vandana" as an overture followed by the hour-long laser documentary on Swami Vivekananda, kept the audience spell-bound for the entire show. The jubilant audience shouted "Bravo! Bravo!!" 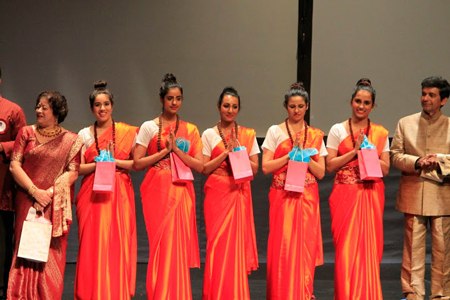 when MSP group received standing ovation after the show. 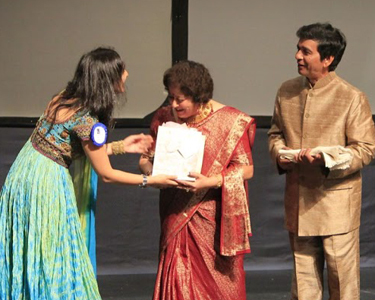 Mrs. Manju Gupta, President, Ms. Ktriti Dogra, Project Coordinator, and other executive members of SEWA International Houston came up on the stage to felicitate the group with gifts amidst a burst of applause from the audience. Later Manick and his wife came down to the audience to the awaiting people who wanted to convey their personal greetings. The reporter covering for TV Asia asked, "What do you think of the people's reaction to this show?". 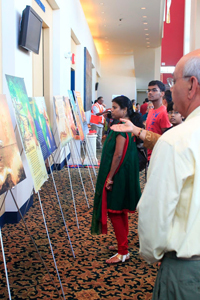 "I am absolutely thrilled", said Manick, "My goal is to present the 19th Century story in the light of the 21st Century and spread Swamiji's messages on religious harmony and brotherly love to every corner of the USA - that seems to have taken a good start. The audience is happy, so am I". 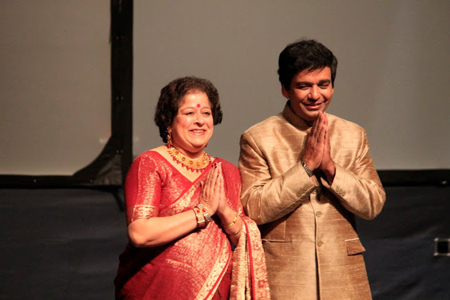 Earlier, on September 7, Saturday, upon his arrival in Houston he was also interviewed live by a few popular radio stations that included Shobha Joshi's Geetanjali Radio at AM1320, and Open Forum at AM1480. 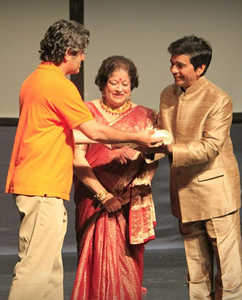 "Manick Sorcar at His Best - Laser Documentary on Swami Vivekananda .....The sixth annual fundraiser of Sewa International held at the Stafford Center on Sept 8 was a resounding success being a totally sold out event thanks to the featured attraction, Manick Sorcar’s one of-a-kind unique laser documentary on the life of Swami Vivekananda. ....The audience was spellbound and proved to be very emotional for several, and the Houston crowd honored him with a standing ovation".